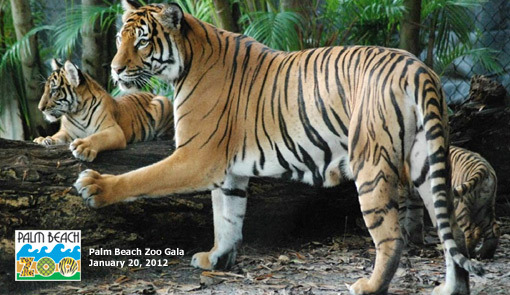 West Palm Beach, FL – “Born to be Wild,” the Palm Beach Zoo’s annual gala, will be held Jan. 20, 2012, at The Breakers in Palm Beach. Organizers hope to surpass last year’s fund-raising goal of more than $1 million to help further the zoo’s mission of protecting wildlife. Chairing this year’s event are Lillian Fernandez, Karin Luter and Carol Mack. Kristy Clark, Darlene Jordan and Bridget Koch will serve as honorary chairwomen. Cocktails begin at 7 p.m., with dinner and dancing to follow. Heatwave will provide the entertainment. Individual tickets are $750 and junior tickets (40 and under) are $500. The Palm Beach Zoo, incorporated in 1969, provides habitat for more than 1,400 animals within 23 lush, tropical acres. In May 2011, the zoo became one of only two institutions to successfully breed Malayan tigers, an endangered subspecies of tiger with only 300 to 500 believed to remain in the wild. The zoo’s three male cubs comprise 60 percent of Malayan cubs born in 2011, making the Palm Beach Zoo the most successful breeding institution for the year. With three subspecies of tigers already destroyed, the animals are nearly extinct. The worldwide wild tiger population has dropped from more than 100,000 in 1900 to fewer than 3,200 today. The World Wildlife Fund estimates that at the current rate of decline, tigers will be extinct within a generation. The Palm Beach Zoo is partnering with Panthera and the Wildlife Conservation Society through its Tigers Forever program to help protect tigers and their habitat. The Palm Beach Zoo is nationally accredited by the Association of Zoos and Aquariums (AZA). For more information, call Pam Viscusi at (561) 533-0887, ext. 285.